During a solar eclipse, time becomes compressed. The few moments the moon takes to edge its way between the sun and earth disturb the normal cycle of day and night, under certain circumstances even throwing a person’s spatiotemporal orientation over the edge. 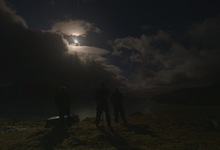 At least so say some of the impassioned eclipse chasers heard off-screen, pursued by Lukas Marxt and Vanja Smiljanic on the Faroe Islands. Marxt and Smiljanic organized material they and others recorded during a solar eclipse in March 2015, to create a small catalogue of cosmic visual data. Esotericism is the subject, not the method. When bright light rescues fragments of the landscape from complete darkness, it is as if mankind is attempting to reassure itself that the world still exists.